Working in an office sure can be boring, and it doesn’t help when some do-good know-it-all sits across from you all day. You know the type–he runs to the boss when you do something wrong, complains when you get the last bag of chips in the snack room, or takes credit for your good ideas. No longer will you sit back and take it! Grab whatever you have nearby–a crumpled piece of paper, a mug, a shiny red stapler–and wipe that smirk off his face in this feel-good app. 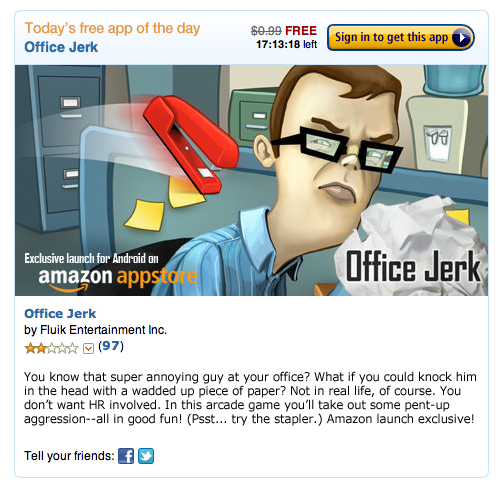 Unleash your interoffice rage and embrace your inner jerk in Office Jerk for your Android device. Amazon are giving this app away today, so if you fancy getting revenge on the Office Jerk, click here to download.